Fuller Center Bike Adventure working on a project with Illinois Valley Fuller Center during their visit. Located in the north central area of the state the Illinois Valley Fuller Center will be serving Peoria, Tazewell and Woodford counties in Illinois, known as the Tri-County area. Their primary focus will be to help low income families and veterans with critical repairs. They will be joining forces with other local non profits to help improve the existing housing stock not only for existing homeowners but to help families with vacant properties that might be available. 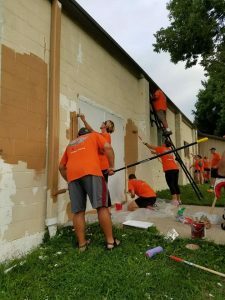 The Fuller Center assists Central Illinois Veterans with basic home repairs, spring and fall yard cleanups, furnace safety checks and recognition. Volunteers are needed to help with home repair projects and yard cleanups. Financial support-donations may be sent to Illinois Valley Fuller Center for Housing, 1716 N. University Ave., Peoria, IL 61604. Illinois Valley Fuller Center for Housing is a 501c3 non-profit and donations are tax deductible.